Teacher Appreciation Week is Now Underway! Join National PTA in celebrating the hard work of outstanding teachers during National PTA’s Teacher Appreciation Week May 5-9. This year we commemorate the 30th anniversary of the week and encourage PTAs at the national, state and local levels to recognize the incredible contributions teachers make on behalf of children every day. Watch the video below to see how several young students plan to # ThankATeacher this week. Follow us on our new Instagram page, and check daily for new photos. Use #ThankATeacher to follow the conversation online. Don’t miss a blog post from President Thornton as he talks about his favorite teacher later in the week. With your help, this will be the best Teacher Appreciation Week ever! Enjoy the video! Special thanks to all of our advocates, friends and supporters who participated in our first-ever, “Let’s Move” video and answered First Lady Michelle Obama’s call to move and stay active. Enjoy! 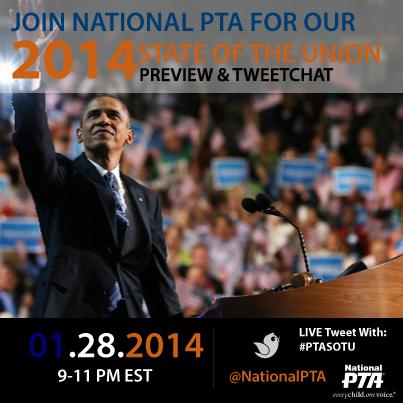 Join National PTA for a Twitter chat on featuring hopes, ideas, and predictions for Tuesday night’s State of the Union address. What education topic would you President Obama to address? What issues matter most to you? Join us tonight as we discuss these topics with experts from National PTA to answer your questions and speak to the work that @NationalPTA is doing on behalf of #EveryChild. Want to participate? Follow @NationalPTA. Search for #PTASOTU and use the hashtag in your tweets to join the conversation. National PTA is proud to announce that President Otha Thornton has been named to EBONY magazine’s Power 100 list of the nation’s most influential African-Americans. Thornton will be featured in the December/January issue of EBONY, which will hit newsstands in early November. Each year EBONY Magazine hosts an annual celebration of Black America’s foremost movers, shakers and leaders. The 2013 Power 100 includes a broad-range of influencers and game-changers across a wide spectrum of industries and areas. The 2013 EBONY Power 100 list includes media mogul Oprah Winfrey, actress Kerry Washington, civil rights icon Congressman John Lewis and Marian Wright Edelman, founder of the Children’s Defense Fund. In celebration, the second annual EBONY Power 100 Gala will be Nov. 4 at New York City’s Jazz at Lincoln Center’s Frederick P. Rose Hall. The event will honor Motown Records founder Berry Gordy with a Lifetime Achievement Award, and recognize the achievements of the 2013 Power 100 List. Thornton was installed as president of National PTA in June 2013, making history as the first African-American male chosen to head the 4 million member association. Under his leadership, National PTA has collaborated with prestigious organizations including the NFL and AARP. Since taking the helm, Thornton also has launched an awareness campaign to celebrate the achievements of diverse student populations and share resources and advocacy tools to help school communities address the unique needs of every child. In addition to being recognized by EBONY, Thornton recently was featured on NBC Nightly News with Brian Williams. For more information visit EBONY’s Power 100 list. National PTA President Otha Thornton will appear on “NBC Nightly News’ with Brian Williams” tonight, Tuesday October 8. President Thornton will address leadership, advocacy, and membership. Check local listings for when “NBC Nightly News with Brian Williams” will air in your area. Follow the conversation on Twitter: @NationalPTA @PTAThornton and @NBCNightlyNews. 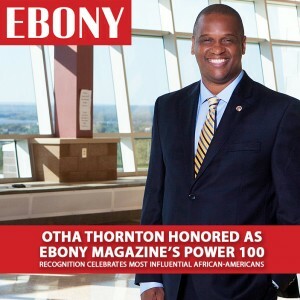 Mr. Otha Thornton was installed as president of the National Parent Teacher Association (PTA) in June 2013, making history as the first African-American male chosen to lead the association. The ceremony took place at the PTA’s annual convention in Cincinnati, OH where he addressed the more than 1,000 attendees in his inaugural speech. National PTA® comprises millions of families, students, teachers, administrators, and business and community leaders devoted to the educational success of children and the promotion of parent involvement in schools. PTA is a registered 501(c)(3) nonprofit association that prides itself on being a powerful voice for all children, a relevant resource for families and communities, and a strong advocate for public education. Membership in PTA is open to anyone who wants to be involved and make a difference for the education, health, and welfare of children and youth. 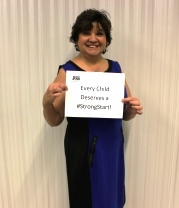 Read more about National PTA and our ongoing work on Twitter, Facebook and at www.pta.org. This year’s fully digital PTA Back-to-School KIT is full of resources and tips for building and sustaining your local PTA unit. As a PTA leader, it is critical that you regularly keep your members informed of the work your PTA is doing and how they can get involved. In our Communications Quick Reference Guide PTA has detailed plans and suggestions on everything from leading meetings to sharing messages with fellow PTA members, school staff and adminsitrators, and community members. As you build PTA programs this school year, develop great working relationships with reporters and media personalities. The media can be a valuable partner in sharing your story, and we encourage you to reach out using our sample media advisories and tips to get started. Social media is a powerful tool for individuals to share ideas and content and facilitate a conversation. 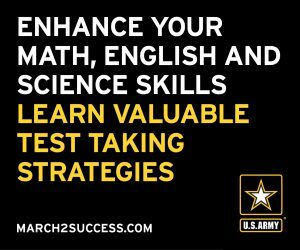 It also is fast, free, and easy to get started. From Facebook to Twitter, there are many platforms for you to quickly showcase your PTA at its best and receive feedback from friends, colleagues, and the broader community. We know that many of you take photos highlighting your many events, projects, and initiatives. Consider rolling these images into a photo collage summary using one of many FREE and user friendly video services like Animoto or pay a small fee for other services like Roxio’s PhotoShow. When using social media, be sure to foster transparent, honest, and knowledgeable dialogue to build engagement and interest in your program. Also remember that photography and videography convey the excitement of your events and are great channels to feature your events, but be sure to use photo release forms to obtain a photo subjects’ permission for use in promotional materials. For further guidance or ideas to increase your following online, review our social media policy to help establish your PTAs online boundaries. Consistent branding and a uniform presence for National PTA and all PTA produced material is key. Our branding guidelines are imperative and have helped to establish PTA as a leader on advocacy for children. Speak with a consistent message and have a credible voice to serve as a media spokesperson or representative from your Unit. 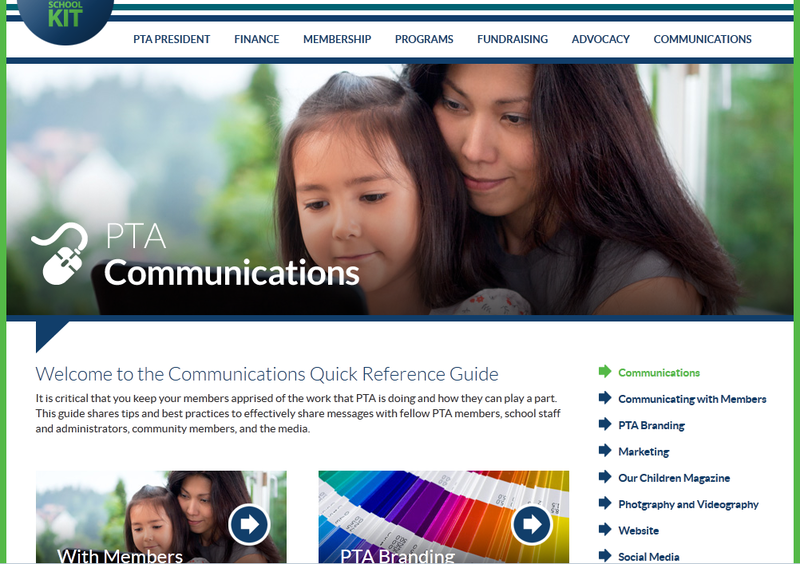 As a PTA officer, spend some time with your PTA leaders in the coming weeks developing your communications strategy to promote and share your PTA success this school year. Effective communication is key to promoting your programs to a variety of groups and building support from the community.